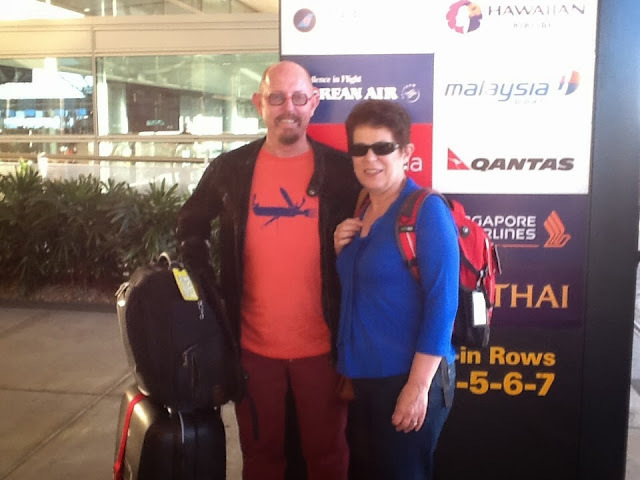 At the Brisbane International Airport ready for our Italian adventure - 15th October 2013. Our friends Jean and George kindly drove us to the airport. 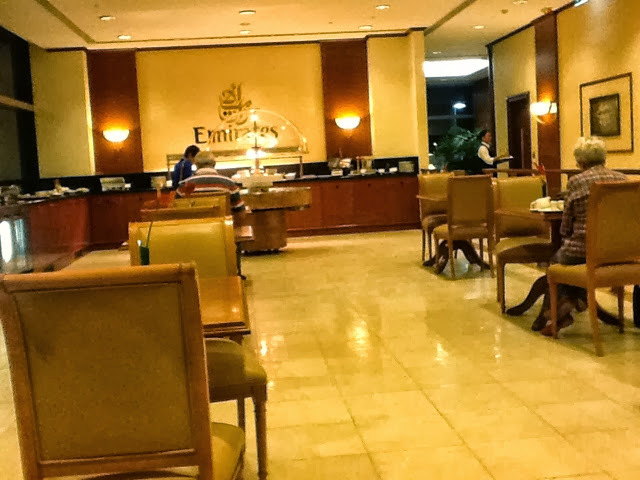 The Emirates Lounge in Brisbane before we left is where Karen found the food. .....and Peter found the drinks!!!!!!! On the mobile for the fifth time in an hour. Karen is behaving like she s giving child birth - over organised and now confused with what to do. 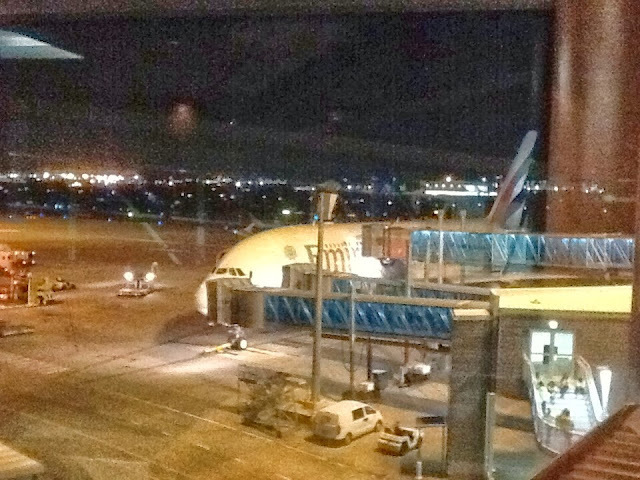 The A380 is unbelievable - from a business class perspective the take off was almost unnoticible. 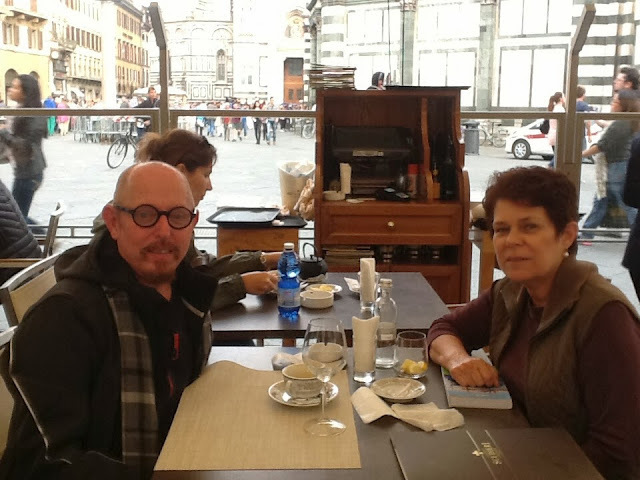 We have just ordered dinner - beef tenderloin for Peter and steamed blue eye cod for Karen. I'm watching The Lone Ranger and Karen is catching up with her Courier Mail crosswords. 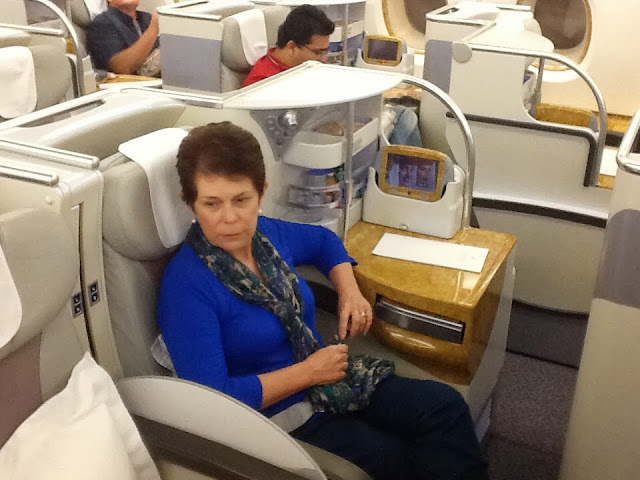 She has been given a mattress to ease the well padded business class seats and the electronic massage. 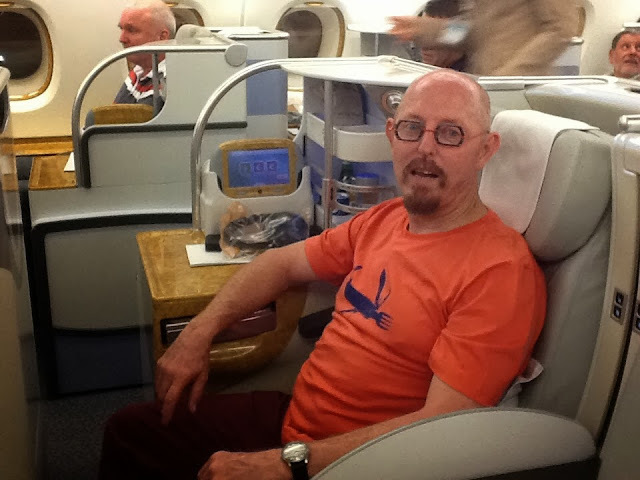 After an enjoyable three hour stay in the incredible Emirates Lounge in Dubai we were off to Milano in a 777 which had slightly less room than the A 380 but was still amazing. The service on the flight was unbelievable. Moët & Chandon Brut is a very nice drink before, during and after a meal. The barren land, dams and small towns as we flew North West out of Dubai was quite enlightening. 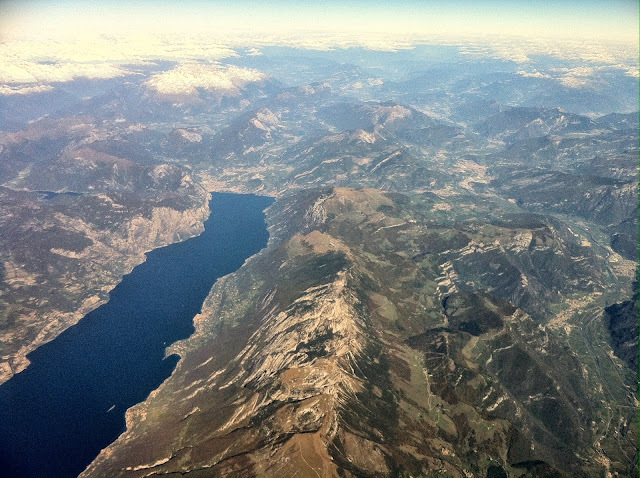 However one of the special moments was flying over the Swiss and Italian Alps - the Dolomites. 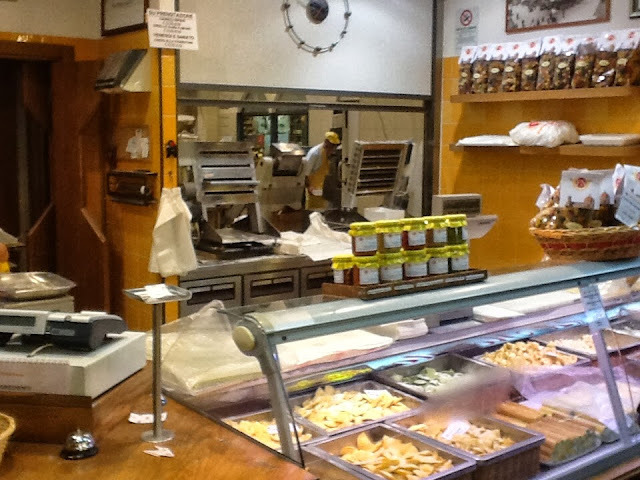 An uneventful and typical very relaxed Italian approach to Immigration and customs. Never checked any bags and no questions - we must have looked Italian enough - just opened our passports, stamped them and that was it. Very proud of ourselves buying our Malpensa Express train tickets from the machine (only written in Italian) to reach our hotel in Milano. 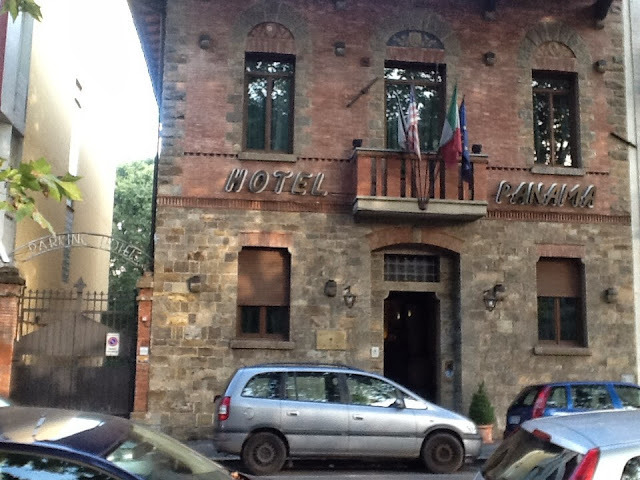 A "green" Eco hotel, 100 meters from the impressive central station. 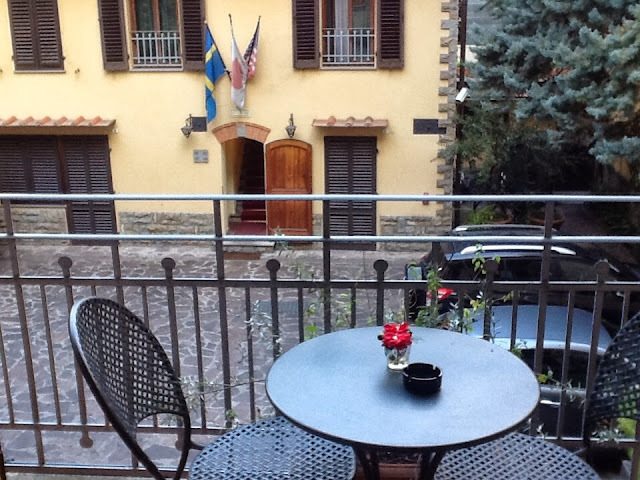 Our first experience of the day away from out hotel area was to enjoy true Italian coffee at the Galleria next to the Duomo. 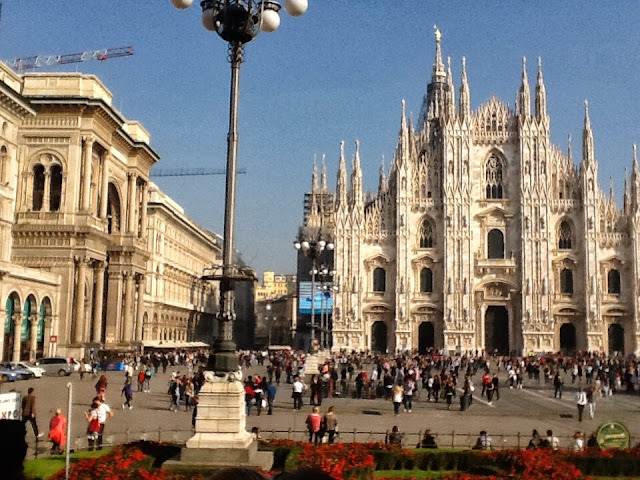 After exploring the Duomo area we decided to have a double-decker bus ride around the central part of the the city. So much history to absorb. Peter's Italian vocab is returning and Karen has starting calling him Pietro automatically. 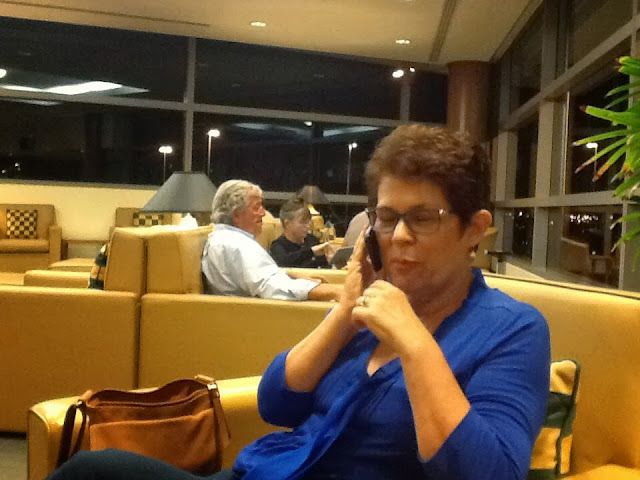 He phoned Alexandro's (who works for Tim at Ciccio's) father and Giorgio (his second cousin's husband) and we are meeting up with them while we are here. 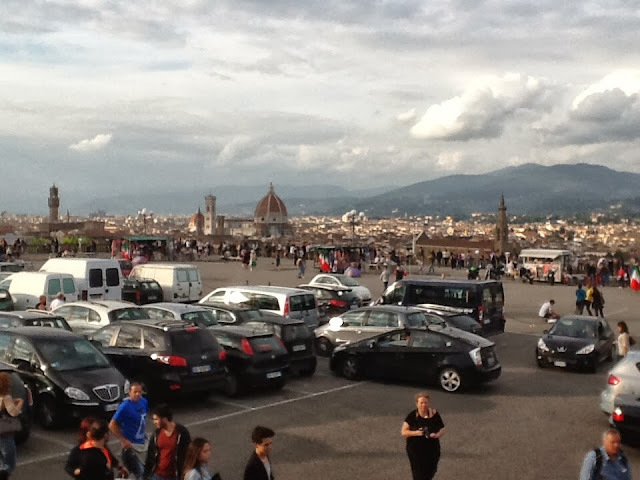 Off toFlorence tomorrow. 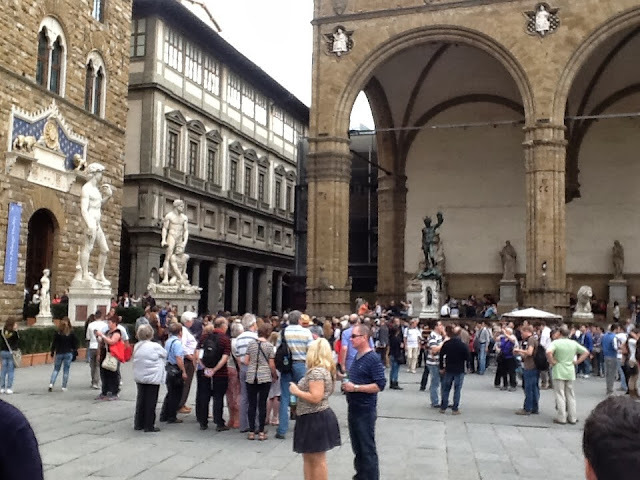 After booking into the Panama Albergo we decided to walk down to the centre of the old city of Florence. 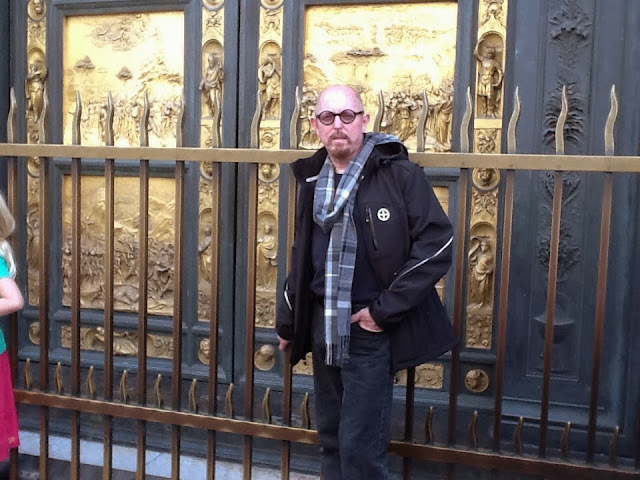 We decided to catch up with David at Florence's Galleria dell'Accademia. Michangelo's David that is. A beautiful eighteen foot sculpture, but so out of proportion. 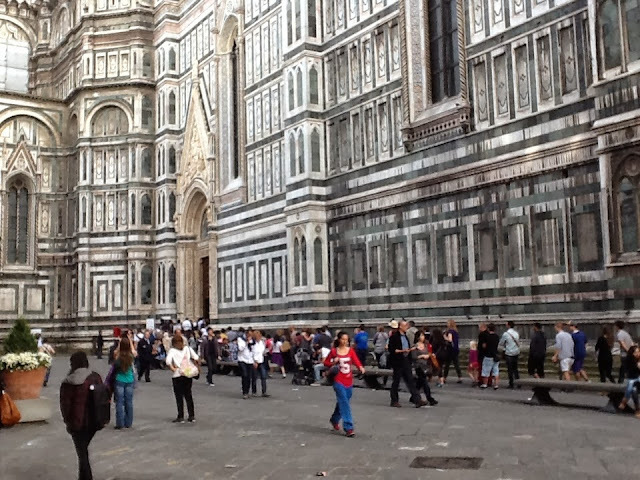 The Duomo was impressive, especially the white and green marble pattering on the outside. 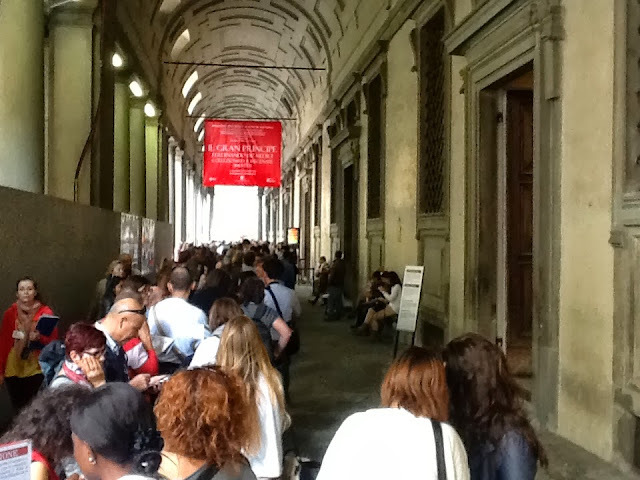 The line up to go to the top of the of Brunelleschi's dome via the 463 steep stone steps helped us decide in stead, to view the Baptistry and the gilded bronze bas-relief doors designed by Ghiberti. After a typical European breakfast we headed off to the central station to finalise our seats on the train to Torino next week. It only took an hour! 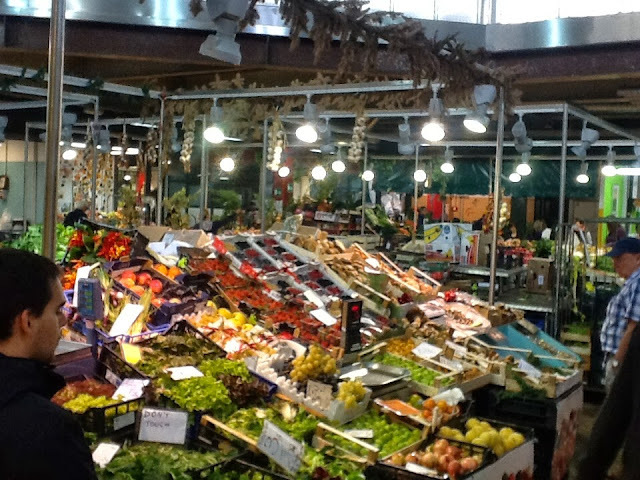 On the way we also stopped at the Central Markets. I wish we had something like this in Brisbane. Karen was in her element. Coffee was needed and then we decided to take a hop-on-hop-off sight seeing tour. 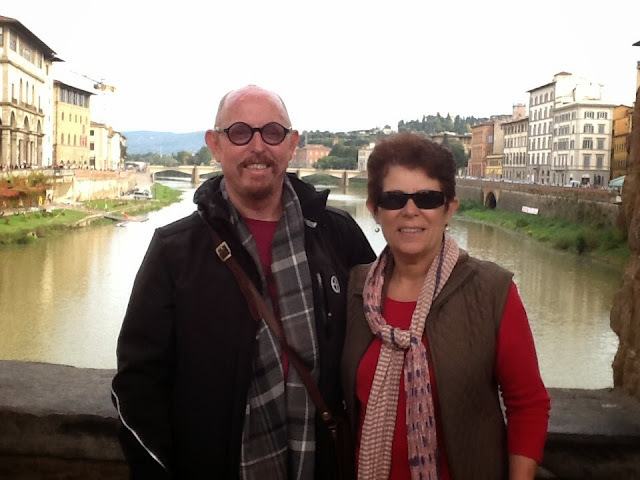 We got off at the Uffizi Gallery. This, not the tourist season, yet we waited for about ninety minutes to get in. It was exciting to see some of the old masters again. 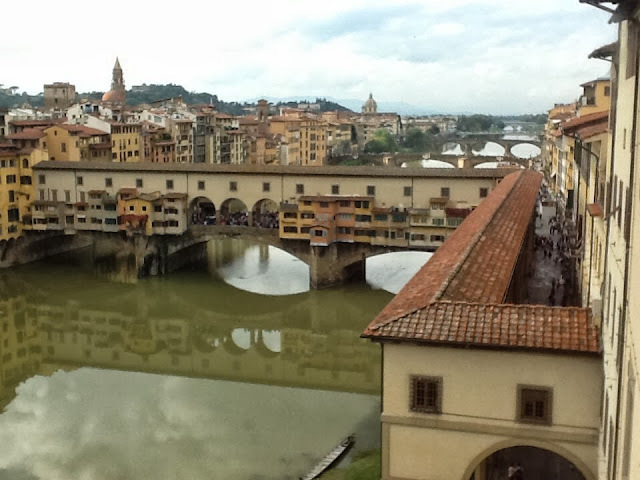 The Ponte Vecchio was next to check out the gold. We finished our bus tour through the Monte alle Croci, then back to central station to walk home to our hotel. 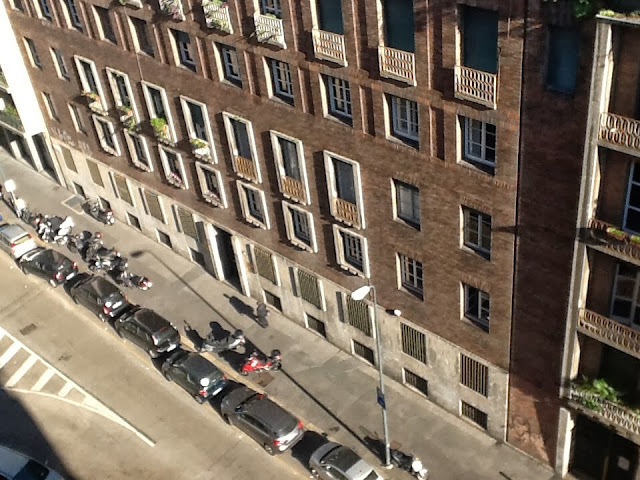 Perhaps the highlight of the day was to see and hear two police motorbikesand two police cars with flashinglights and sounding serins escorting an empty Juventus Football Club bus through the streets of Florence. Enjoy your trip, see you when you get back. Sounds like you are having a great time. Is it cool? Scarves and jackets.